Over the past several days I’ve assembled the results of three forms of divination into what may seem a hodgepodge of craft but which serves the purposes I’ve felt called to work with. More about them in a minute. When even our choice of the means of divination we’ll use is itself potentially a matter for divination, we can quickly get lost in a hall of mirrors and never get out and actually do something. Turtles all the way down. We’ll continue to make mistakes anyway, even with the best of divinatory insights. There’s small advantage in refraining from acting simply because our guidance is incomplete. It’s incomplete at the best of times. That’s not a weakness but the definition of the proper field for human action. The gods don’t want, need, or make puppets, after all. (Not most of ’em, anyway. Those that do, flee as fast as you can.) Deprive us humans of initiative and will and vision, and neither human nor divine sovereignty means much. The first divination I already mentioned in the previous post: the turtle in our yard, crawling north. Near midsummer, a reminder of the North, of earth, of manifestation, of the vessel for all this heat and light — the realm of form. After I completed my work of mowing for the day, I spotted a fellow being on its own journey. End of story? No. Whatever we do individually, we’re also companions on the way all creatures follow, alive here in time and space. All things are themselves and signs. We, too, endlessly offer our existences as tokens, pointers, guides to others. Meaning is what we do. Our presences always carry a specific weight and effect. One thing imprinted itself clearly in my awareness, a laugh at self. I’ve been turtle-slow to acknowledge this inner tug, this call for a grove, and to work with it. The turtle, blood warmed in solstice heat, vigorously crawled some five meters without pausing. Even I am faster than you these days, human. The turtle or tortoise is absent from the Celtic-inspired Druid Animal Oracle, but it’s a living symbol among native peoples of North America. Turtle Island. Many tribal stories recount how turtle does its thing, swimming to the bottom and resurfacing. A guide, an opener of possibility. In the efforts of many spirit beings to create land for plant and animal life to dwell on, turtle carries on its back the earth that muskrat or duck or some other bearer brings up from the bottom. Carry the earth to us, for us, under us. Turtle carrier, guide, creature yourself, alive in this place, complete in your own being and purposes. We could work out a new divination system following the shell markings of the turtle. The idea certainly isn’t new with me — it exists in various forms already. Anciently the Chinese oracle bones derived from turtle shells. But even as new tarot versions and re-workings of the runes and ogham make their ways into our awareness, so too does the power of all things to serve a dual potential as themselves and as symbols. We’re always ourselves, but linked as we are, we’re also more. We live and we signify. A second divination: obstacles, multiple reversed runes, blocked energy. 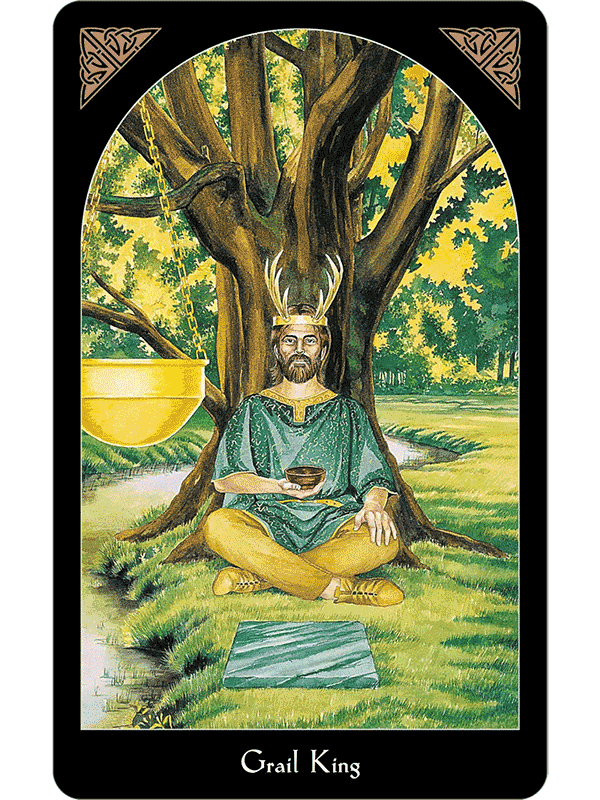 Taking the three divinations I performed as past, present and future, this second divination certainly outlines an accurate picture of the present. After-the-fact interpretative retrofitting of a divination? Sure … why not? Or take it as 1) existing causes, 2) materials, circumstances, contributing influences, and 3) consequences, results, practices to assist coming manifestations. Either way. Entering my potential grove from the northwest, and facing east. What have I let grow to block my way? I’ve worked most with the Arthurian Tarot, so it seemed prudent to turn to this for the third divination, because I seek insight into constructing a Druid grove. I enter my potential grove space from the northwest, improvising an invocation and pausing at each of the quarters and then the spirit center to lay face down a card I chose by touch and guidance from the deck. I circle a second time to each quarter and pick them up and view them. 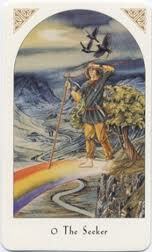 Here are my cards: North — the grail king; East — Arthur; South — the Spear Maiden; West — 2 of Spears; Spirit center — Taliesin. 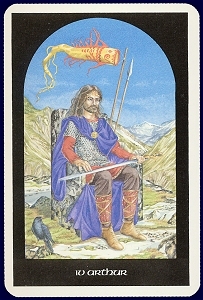 The Grail King, associated with the West, guards hidden mysteries, approachable through imagination, dream, feeling. Yet he shows up in the north, and also paired with words. He offers guidance to negotiate the path if I am alert. If I abandon a stubborn fixity and pay fluid attention to the earth, to my body, to our shared physicality, then needed energies will come for manifestation. I can help myself by writing the way, by wording my passage as I go, by welcoming, shaping, and passing along my share in the voice of awen. 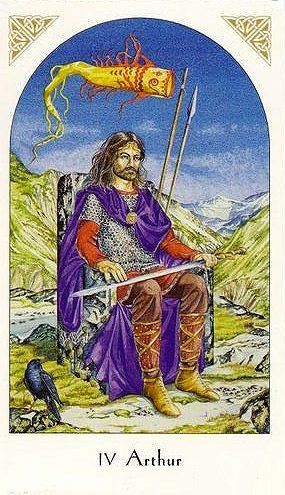 Arthur, from the major arcana, occupies the traditional fourth Emperor position. The Matthews’ handbook* notes, “The primary feature of Arthur’s role is guardianship and defence of the land … His creative energy is fuelled by close Otherworld contact through the mediation of Sovereignty” (Matthews, pp. 29-30). In the realm of thought, Air and the East, he offers a gift of dynamic strength, along with a clear reminder of where strength derives. The Matthews further observe, “Whenever he attempts to depart from his kingly responsibilities … or live a life of his own, he comes to grief” (p. 30). Once we walk a certain distance along the path, we can no longer validly make a permanent retreat from human life, much as a hermit-like withdrawal still appeals to me — has, for much of this lifetime. The Spear Maiden, signifier for the South, “shows the way through impossible situations by her daring, often by disguise or by shape-shifting” (Matthews, pg. 78). Again, I need not insist on a particular form, but allow it to remain supple, fluid. And take boldness for my approach, not this listless, hesitant, intermittently indulgent and slothlike state that’s dogged me for over a year. Boldness fuelled by Otherworld/Innerworld contact. The work of the OBOD Ovate grade, which I entered formally at the equinox last fall with initiation, but haven’t really yet engaged. Spears again for the West, this time the 2 of Spears. A theme’s emerging. Matthews’ text says, “The skilled organization of resources leads to the achievement of desire; intuitive synthesis; dynamic drive” (Matthews, pg. 74). South in the West: intuition, yes, but propelled by the fires of the South. Finally, the Spirit-center, under Sovereignty. A fitting place for Taliesin to appear, chief of Bards, initiatory model for Druids. He represents transformation “of the mundane into the spiritual,” a worthy goal for the making and purpose of a Druid’s grove. He is ready to aid the seeker in contacting “the living wisdom of the Otherworld … [B]y prophecy and far memory, he can instruct and guide … well able to represent images to the receptive mind and forge connections in the waiting heart” (Matthews, pg. 32). Images: Sovereignty; Grail King; Arthur; 2nd image of Sovereignty; Taliesin. Matthews, John and Caitlin. 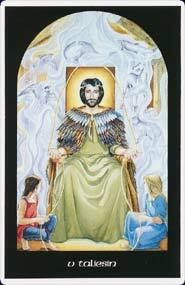 The Arthurian Tarot: A Hallowquest Handbook. London: Thorsons, 1995.